Photo of Bighorn Logging’s yarder taken by Lindsay Mohlere. The report entitled “The Ticking Time Bomb in Idaho’s National Forests: Where do we go from here?” discusses recommendations to address this extreme forest health crisis. Jonathan Martin, chairman and CEO of RoyOMartin of Alexandria, Louisiana, was honored with the Bronson J. Lewis Award at the APA Annual Meeting in Coeur d’Alene, Idaho. The meeting took place Oct. 17-20, 2015. The annual award is named after the late Bronson Lewis, who served for 24 years as secretary and then executive vice president of APA. The award recognizes individuals for their lifetime leadership and outstanding contribution to the industry. Martin has been a recognized force in the structural panel industry for more than 40 years. In 1981 he directed the design and construction of the first oriented strand board plant in the South, and in 1995 he directed the design and construction of a new, state-of-the-art plywood plant. Rick Svilich reported for the American Forest Resource Council (AFRC) that Klamath, Six Rivers, Shasta Trinity, and Mendocino National Forests did not meet their Fiscal Year 2015 targets. The combined target was 103.2 million board feet (mmbf), but the final tally was 82.3 mmbf or 80 percent of the goal. 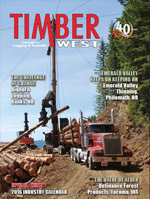 Sawlog volume accounted for 57 percent, biomass accounted for 28 percent, and firewood accounted for 15 percent.